Oh my goodness Azita, this is my favorite ever. My brother in law parent is Iranian. He thought me how to make this rice. It's become my favorite. Love Tahdig! Yum! It is on my list of posts too!! My Persian Kitchen, Yes, I saw your beautiful bread tah dig! Taste of Beirut, It happens to me too! Chow and Chatter, Thank you Rebecca.you're very kind. I'm glad I found your blog...it's wonderful! I have seen this is a magazine and wanted to try it out. i wasn't sure I could do it. Thanks for the detailed recipe. Soma, Give it a try. It's delicious! 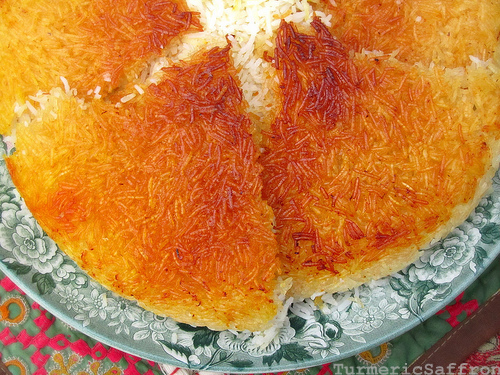 Ive always loved Tahdig since I was young but I've never attempted it because I felt it would never turn out right.I will give it a try using your recipe.Thanks for sharing. cmiranda, give it a try, making tahdig is not as difficult as it may seem. let me know how it turns out! thanks for visiting. love your blog! keep 'em coming! quick question- do you boil/cook the rice before starting to build the bottom with the pyramid of rice? if not, then would 1 cup of water for 2 cups of rice be enough? Hi. I'm new to Persian cooking. My fiance is Iranian and I just got the cookbook "A Taste of Persia." I've only attempted the rice so far. :) Anywho, I made it in my rice cooker and the bottom of the cake did form a crust but it was just sticky and very slightly browned. There was no crunchy tahdig going on. The shape, and saffron in the middle was beautiful, but I was bummed about the poor tahdig. My cooker only has a white rice option and a brown rice option. I used the white option for white basmati. Elizabeth, That's a good start! I suggest using a non-stick rice cooker and cook the rice for an additional 15 minutes or so. There are Iranian non-stick rice cookers that are good for making tah dig, you may find them in Iranian stores. Let me know how it turns out. Good luck! Azita - I looove tahdig, but I've always been afraid to make it myself. Your method says to use a heavy non-stick pot, but are there any specific brands or anything that you recommend using? Rose, I use good quality non stick cookware mainly for rice because the bottom crust (tah-dig) is prone to sticking and burning. So far, I'm satisfied with Cuisinart(GG Eco-Friendly) products. Give it a try and let me know how it turns out! Hi Azita, my potatoes in the tadig don't come out crunchy but always soft. I usually fry the potatoes in oil on both sides on high flame till golden, then lower the flame to the lowest, add the rice and cover with a towel and lid and let cook for another hour or so or till I see steam coming out ... what am I doing wrong? Mika, I would lightly fry one side of the potatoes in hot oil with a dash of salt on medium-high heat, turn them over and then I add the rice. You'll need to wait a few minutes until the steam starts coming up from the rice in the pot, wait for couple of minutes then you'll lower the heat, wrap the lid with a towel cover and cook for about an hour. Thanks! Will try!! I hope my potatoes will be crunchy this time!!! :) thanks! I usually use my rice cooker, so I bring rice, salt and water to a boil, let boil for about 2 minutes, then pour into a strainer. In the pot, I put a tablespoon ghee, cover the bottom with either thin slices of raw potatoe or thinly sliced Persian bread, then heap the rice into the pot and form a pyramid (like you describe above). I then put the cooker to "dark crust" (makes about 30 to 40 minutes). That's all. The rice turns out perfect, the tahdig deliciously crisp. I usually turn it all over onto a serving plate, just like a cake. When using a heavy pot instead of the cooker, I make sure I put the heat to minimum, not more. The rice (pre-cooked, like above) then takes about 30 minutes to be ready. Oh, and tahdig with yoghurt and an egg yolk is also very tasty. Cabbage is also nice for a different type of tah-dig. all the recipes i've seen or tahdiq look so incredibly unhealthy, especially because they use at least a cup of oil! good to see that there's less oily possibilities, so i'll give it a go next time. looking forward to the potato tahdiq the most. Stacking up the rice in a pyramid shape keeps the rice more fluffy and easier to release the steam by gently poking a few holes in the rice. Also, keeping the rice in the middle prevents the rice from sticking to the sides and getting dried/burnt. 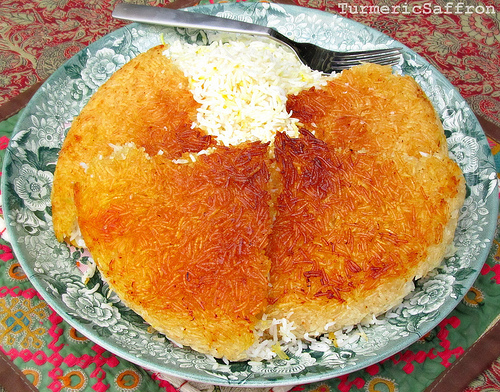 We only want the tahdig at the bottom for this kind of rice. It's okay to have a flat surface when making kateh or cooking rice in a rice cooker. hi azita! i love your blog. my boyfriend is persian and i love trying to make persian food for him. i'm making him tachin tomorrow night (love your recipe) and i have a question. could i make tahdig on my tachin? if so, would i still have to use a pyramid shape? how long would i cook it on the stove for? any other tips? THANK YOU SO MUCH. your blog is so beautiful & amazing! Thank you, Buelsy. For tahchin you don't need to make the pyramid shape. 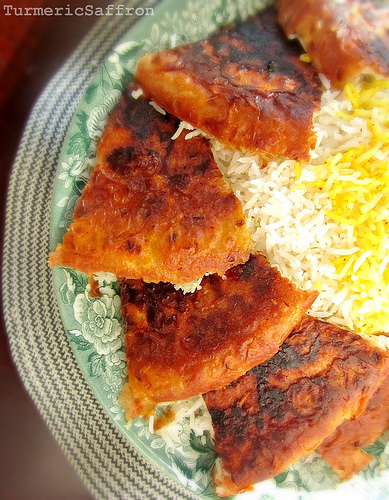 Cook the the rice for about an hour in the oven or on the stove and it should have a thick layer of tahdig. Yes, that is what I meant to say. I made the necessary corrections in the recipe. Thank you. Thanks so much for your swift response, Azita! I'm going to try making this - I love tah-dig. years ago I had a persian boyfriend who taught me this. we used do dip the hot pan in cold water for a few seconds to release the crusty base before turning it out onto a plate. It works about 50% of the time! We also did a rice dish with vermicelli and sultanas that was delicious. Have you tried making it with Lettuce ? Not yet! I'm going to give it a try soon! My sister once made a DELICIOUS tahdig, it was thick and crispy. 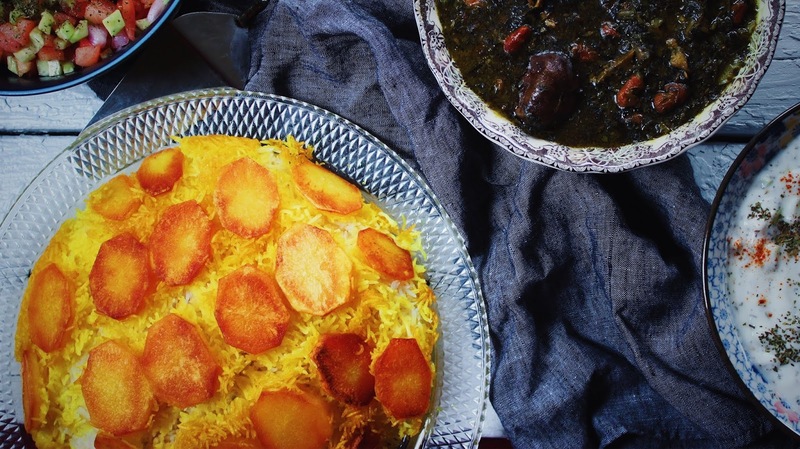 She said her secret ingredient that made it so wonderful was yogurt...I've tried looking for other tahdig recipes that suggest this, but haven't been successful, do you have any input on this? Hi Nasrin jan, you can mix a cup of rice, 2-3 tablespoons plain yogurt, saffron and oil/butter, cover the bottom of the pan with the mixture and continue following the recipe as directed. Thank you for this. I am so glad I came across your blog! I have a very eclectic way of cooking, thanks to my military father and our travels and a dear friend of mine as a child was Iranian. I remember eating family dinners at her home and I remember watching her mother and grandmother cook and I try so hard to remember things. Now I am grown with a family of my own and when I cook my mom tells me I must be Persian. I take it as a compliment. I can't wait to try out some of the recipes you have! Love your Blog...and what a nice name! Hi, you parboil the rice first, drain rice using a colander, add oil to the bottom of the pot, layer the sliced potatoes, add the rice, cover and cook. Azita Jan, this is brilliant! I tried Tahdeeg yesterday from an Iranian restaurant, and it was amazing! So thick, and crispy and saffron-y! Do you have any special tips to prevent the Tahdeeg from burning? And will ghee be okay instead of butter? Amay, use enough vegetable oil or ghee to cover the bottom of the pot over medium heat. Add the rice, reduce the heat when steam starts coming up and cover the lid with a clean kitchen towel and cook the rice on low heat. Thank you! Hi, have you ever made potato tahdig in the Persian rice cooker? If yes can you please share your expertise? 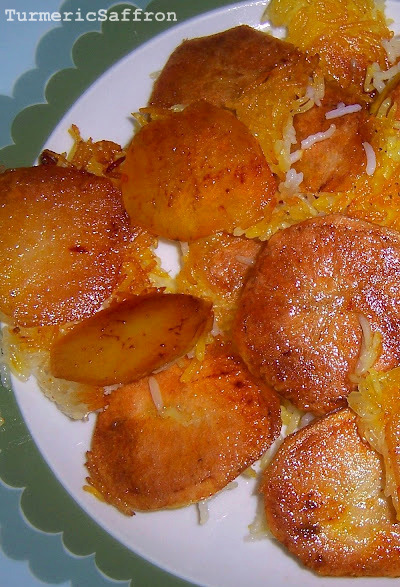 Hi, I have not tried the potato tahdig in the rice cooker and I don’t think it will come out as crispy as I would like it to be. If you happen to try it please let me know how it turns out. 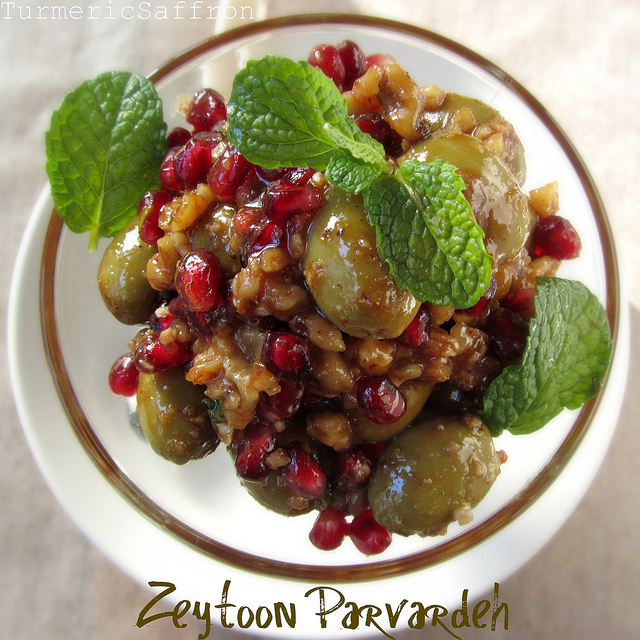 The recipe I was taught added apricot and golden raisins with cardamom. I am trying to perfect the plain crust before moving on to yoghurt and I am trying to make my crust the nice, golden-orange you have there. I think it's in the "frying" stage that this occurs. Can you explain why you need to wait for steam to come out? Does that mean all of the water has gone? I managed to get a uniform crust with a few grains here and there blackened a little, but the golden-orange eludes me. You need to allow excess water to steam off for a few minutes and then cover the pot with a lid. Add a little bit more saffron water. I have been trying to find out if you can make tah-dig using an electric pressure cooker. Jennifer, I've never used a pressure cooker to make rice. 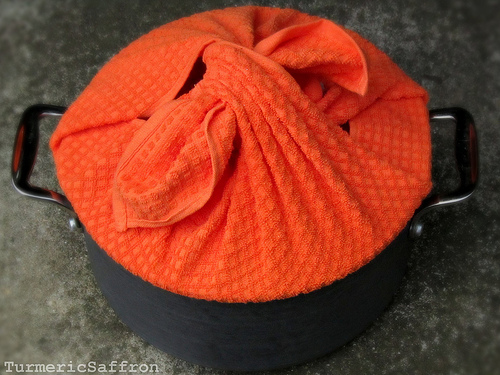 Did you ever figure out how to use your pressure cooker to make tahdig? I only have saffron threads, how can I substitute the powder for threads? Jenn, you can crush the saffron threads with a mortar and pestle to a fine powder. azita i love you ! I can't wait to try it! To clarify, the instructions in step #8 indicate to pour "1/4 cup and saffron over the rice." Is that 1/4 cup of water? Or ...? Thank you so much for the recipe! I just made a correction to the recipe. Thank you. Azita, I made the Tahdig recipe and it came out AWESOME. Worth the wait. Although it took a long time for rice to cook, it gave me ample time to make the Pork and Lamb Koobideh which was also fantastic. Dear Azita, Thank you for your beautiful posts and delicious recipes. I'm wondering if you could put up a recipe for macaroni tahdig. I remember my mom making ماکارونی؛" very much like the American spaghetti dish with meat and tomato sauce and somehow she was able to render a nice tahdig under it all. I've tried to make it but the pasta sticks to the bottom of the pot and doesn't form a sheet of tahdig regardless of how much oil I use. I would appreciate any thoughts or tips you may have. Thank you much. Thank you for forwarding your macaroni recipe. It looks beautiful and delicious. I use cast iron (enamel coated inside) Le Creuset pots and pans. Would you recommend non-enamel? Behess, I use both uncoated cast iron and enameled cast iron pots and pans. A cookware with a non-stick coating works great for rice and macaroni tahdig. I tried this rice in a Persian party... I just loved it and I'm trying to do it but I just have a question. When should I put the bread? I know it should be on the bottom but I will like to know how to do it please. Hi Mirnuccia, add oil to the bottom of the pan, place a layer of flat bread/lavash, spread the rice over the bread and follow remaining directions.